A philosopher is not an isolated being projected into human history from a U.F.O., but a real person with flesh and bones, a person whose mind is inclined to understand the big picture. Even if the object of investigation is subtle and ephemeral, the philosopher uses his own set of knowledge, experience, beliefs, language and common feeling. For this reason sometimes it is needed to study culture and scientific notions of ancient times in order to understand ancient philosophy, otherwise the argumentations may result difficult to follow. The philosopher often considers the scientific ideas of his time as universal and shared by everybody, therefore he does not spend a great effort to explain them in his argumentation. This is true especially when the philosopher is dealing with cosmology, as it is the case for the Timaeus of Plato. Our ancestors were good observers of the sky, maybe because there was no pollution or because they were not distracted by televisions, mobile phones, and videogames. Their cosmology was not a fantasy job, but was indeed based on observations. They understood that there were two kinds of celestial bodies: the stars, which draw constellations and that rigidly move with the sky from east to west, like if they were glued to a sphere, and therefore were defined “fixed”; and seven special objects, which seem to wander over the background of the fixed stars, from west to east, and hence called planets (from the Greek verb πλανάω = to wander). It seemed natural to imagine that each of the planets was tied to a dedicated sphere, each of them rotating around Earth, the privileged observation point. As the planets move independently from each other, the planetary sphere were thought to be separated from each other, and concentric around Earth. Moon and Sun, even if “lamps”, were considered planets. Nobody should be scandalized by this idea, as it is perfectly coherent with the definition of planet (wandering star) used in that time. The definition of planet was changed much later in time. Let’s suppose that each of the seven planets is glued to a sphere and that the various spheres have different dimensions with Earth in their center. How are the spheres arranged, from the smallest to the biggest? The motion of a planet can be simply characterized by measuring the time between two consecutive passages of the planet itself by the same star. This time is called “sidereal period”. Plato and his predecessors associated the dimensions of the spheres to the sidereal period of the respective planets, conferring the smallest sphere to the planet with the shortest “sidereal period” and organizing the rest by increasing periods. In this way they obtained the sequence of the planetary spheres: Moon (whose sidereal period is 0.0748 years, i.e. around 27 days), Mercury (0.241 years), Venus (0.615 years), Sun (1 year per definition), Mars (1.881 years), Jupiter (11.87 years), and Saturn (29.45 years). The biggest sphere, which contains the others, is the one of the fixed stars. This is the starting point for the mystic cosmology of the Timaeus of Plato. The concentric spheres rotate around Earth, from the sphere of the Moon, the closest to us, for which reason our world is defined “sublunary”, to Mercury, Venus, Sun, Mars, Jupiter, and Saturn. The most external is the sphere of the fixed stars. What is causing the movement of the spheres? Plato considers the Psyche in its old definition of “movement”. But this psyche is a particular one, as she has the task to move the whole Body of the Universe. This psyche is the World Soul or, in Latin “Anima Mundi”. She is analogous to the human soul, with some differences. In Phaedrus, Plato describes human soul as a team of a three entities, and compares it to a charioteer, representing the rational part of the soul, on a chariot towed by two winged horses, one of them white, spiritual and with will, who tries to tow the chariot above the heaven, the other black, representing the perceptible part, who tries to drag the chariot down to earth. Human soul is right only when the charioteer, the reason, is able to steer both the horses. On the other hand, World Soul is purely rational and therefore always in harmony. The World Body is made of four elements: air, water, earth, fire. World Soul is not composed by the four elements but by a mixture of three very rarefied entities: the being, the principle of “identity” and the principle of “diversity”, which are wisely mixed by the Demiurge according to well defined mathematical principles. It is worth to check in detail these mathematical principles, because according to Plato they proof the link between the perfection of mathematic (ideal world) and the intrinsic rationality of the Universe. The Demiurge obtains from the mentioned mixture two numerical sequences based on powers of 2 and 3, starting from 1, i.e. : 1, 2, 4, 8, and 1, 3, 9, 29. Let’s consider the interval between 1 and 2 and let’s fill it with the arithmetic mean, that is 3/2, and with the harmonic mean that gives 4/3 (for more details see note 1). Timaeus, on the dialogue, identifies a special relation between the arithmetic and the harmonic mean of 1 and 2. By dividing 3/2 by 4/3, 9/8 is obtained. Then it is verified that the same result, 9/8, is obtained by dividing the arithmetic and the harmonic mean along the whole sequence. 1 9/8 81/64. Now, in order to reach 4/3 a different factor is needed: 256/243. The series then continues with intervals of 9/8, but the last one that is again 256/243 to reach 2. This progression is repeated with the same pattern along the whole series 1, 2, 4, 8. The very characteristic of this series is that 9/8 corresponds to the frequency leap of a musical tone, while 256/243 to a semitone leap. In other words, this progression is the major musical scale by Pythagoras, C, D, E , F, G, A, B, C (see note 2). Summarizing, Plato showed that with a few basic operations it is possible to build up an ordered sequence, periodic and matching with the perceptible world through music. The beauty and regularity of the sequence are an argument to affirm that the order of the Demiurge is good and rational. The Demiurge introduces the intelligible order in the perceptible world, dominating chaos. Logic is intrinsic in World Soul, and it is manifested as harmony. The World Soul therefore brings the cosmic order we see in the natural laws that are object of the modern physics. 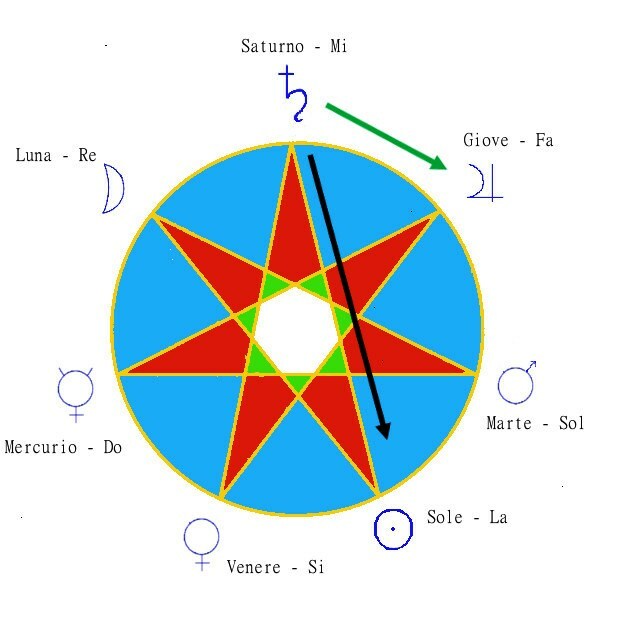 The figure is in Italian and displays the correspondence of the musical notes (in Italian, Do=C, Re=D, Mi=E, and so on) the respective planets according to Neoplatonic tradition. The green arrow, from Saturn to Jupiter proceeding in clockwise direction, show the musical scale associated to the planetary spheres, in this case from the external to the internal. The black arrow, joining Saturn to Sun, follows the interval of fifth (or forth, depending on the direction): following the profile of the arms of the star it is possible to identify the sequence of the days of the week. 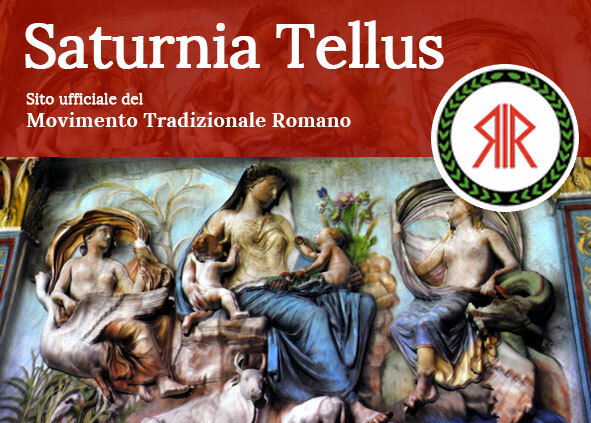 Monday (day of Moon), Tuesday (day of Tiw, associated to Mars), Wednesday (day of Woden – Odin – as Mercury), Thursday (day of Thor, as Jupiter), Friday (day of Frige, as Venus), Saturday (day of Saturn), Sunday (day of Sun). How happens that the Universe moves? This is the explanation on how the intelligible logic moves the spherical structure of the Universe. Let’s imagine the just explained mathematical-harmonic sequence developing along a cosmic piano keyboard, replicating the musical scale for an infinite length (note 3). We cut the cosmic keyboard along its length in two stripes. The two stripes gets closed on themselves forming two circumferences, one external and the other internal, tilted with respect to each other (astronomers know that the angle between the two circumferences is 23°27’). The external circle is the Celestial Equator and it is called “circle of identity”, as per the principle of Anima Mundi. This circle defines the celestial sphere of the constellations and rotates from east to west, this means according to the direction of the movement of the stars in the night skies. The inner one is the “circle of diversity”, and is astronomically related to the Ecliptic, rotating in the opposite direction with respect to the outer circle. The diversity circle then is divided in seven concentric circles with radius proportional to the original sequence of the powers of 2 and three, i.e. 1, 2, 3, 4, 8, 9 ,27 corresponding respectively to Moon, Mercury, Venus, Sun, Mars, Jupiter, and Saturn. According to Pythagoras, the motion of the celestial bodies generate a sound that no human ear can hear, but that is related to the seven notes of the major scale. Every planetary god was then characterized by its own note or musical scale, and this fact was widely used during theurgic practices of the late ancient world. The point of this teaching is that there is a regular mathematical path in the very space-time structure of our world, a cosmic order that is the reflection of the world of forms and that is intrinsically present in the World Soul thanks to the providential action of the Demiurge. The world is not only a body, but also a soul and a mind (the same logic). As we human beings have a soul that shares the same principles, we can understand the regularity and the logic of the world. Moreover, we aim to it, and we rejoice when we find it. This understanding of the world explains the reason of our innate propensity to knowledge. This is a great result of the Platonic philosophy. If we look at the sky, we see the providential action of the Demiurge in the harmony of the spheres, that generates time from eternity. An unknown neoplatonic philosopher, some centuries later, imagined that time should be generated cyclically from the motion of the planetary spheres, following the most harmonic of the musical intervals, the fifth. In this way the following sequence was generated: Moon => Mars => Mercury => Jupiter => Venus => Saturn => Sun. This sequence generated the weekly progression: Lunae Dies, Martis Dies, Mercurii Dies, Jovis Dies, Veneris Dies, Saturni Dies, Solis Dies. This progression is still recognizable in Neo-Latin Languages and is well reflected in English, were correspondent divinities of Germanic pantheon have been used (for instance, Tuesday derives from Tiw’s day, where Tiw is the god of war in German mythology, to be compared with Roman Mars). The Demiurge has given us the perfection via the World Soul. The understanding of the Universe has never been so deep, the time has never been so harmonic. Note 1: The harmonic mean was widely used in ancient architecture and sculpture, and mathematically is the reciprocal of the mean of the reciprocals, i.e. given two numbers A and B, their harmonic mean C=2/(1/A + 1/B). It is harmonic because C is that number that exceeds A by the same proportion it is exceeded by B. In the text, if we use in the given formula A=1 and B=2, we obtain 2/(1+1/2) = 2/(3/2)=4/3. Note 2: Actually this is the major scale of Pythagoras, used till the Middle Age. Afterwards, on the 15th century, it was slightly modified to obtain the modern 12-tone equal temperament. At Pythagoras’ time, philosophers characterized the physical property of a note by the length of a pipe or of a string, rather than the frequency. Note 3: It is worth to mention that in modern cosmology there is a theory which is based on infinite length “strings” that cross the universe and vibrate.